Explore Yerevan's surroundings by going to The Monastery of Geghard (in Geghard), Khor Virap (in Lusarat) and Garni Temple (in Garni). There's much more to do: make a trip to Republic Square, examine the collection at History Museum of Armenia, take your sightseeing to a higher altitude at Mount Aragats, and stroll through Lovers' Park. To see other places to visit, where to stay, and other tourist information, go to the Yerevan road trip planner. Yekaterinburg, Russia to Yerevan is an approximately 7.5-hour flight. The time zone difference moving from Yekaterinburg Time to Armenia Time is minus 1 hour. Prepare for a bit warmer weather when traveling from Yekaterinburg in April: high temperatures in Yerevan hover around 24°C and lows are around 8°C. Wrap up your sightseeing on the 15th (Sun) early enough to drive to Areni. Areni is a village in the Vayots Dzor Province of Armenia. 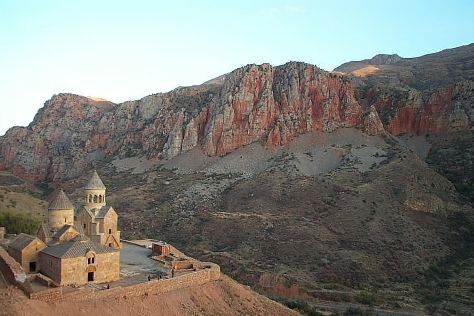 Kick off your visit on the 16th (Mon): Head underground at Mozrov Cave, pause for some serene contemplation at St. Astvatsatsin Church, then take in breathtaking views at Noravank Gorge, then contemplate in the serene atmosphere at Noravank Monastery, and finally do a tasting at Areni Wine Factory. To find maps, traveler tips, other places to visit, and tourist information, refer to the Areni trip website . Traveling by car from Yerevan to Areni takes 1.5 hours. Expect a daytime high around 24°C in April, and nighttime lows around 7°C. Finish your sightseeing early on the 16th (Mon) so you can travel to Tatev. Kick off your visit on the 17th (Tue): look for gifts at Goris Crochet, then take some stellar pictures from Wings of Tatev, then explore the striking landscape at Satanayi Kamurj (Satan's Bridge), and finally contemplate in the serene atmosphere at Tatev Monastery. For traveler tips, ratings, other places to visit, and other tourist information, refer to the Tatev sightseeing planner. You can drive from Areni to Tatev in 2.5 hours. In April in Tatev, expect temperatures between 24°C during the day and 7°C at night. On the 18th (Wed), you'll travel back home.